We are at the beginning of an experience revolution. People´s view on what is important and valuable in their relationship with companies and consumption is changing fundamentally. The obsession with acquisition of material things, kicks and status symbols is being replaced by a search for meaningful experiences and good stories to pass on. In this change lies a gold mine for those who succeed in looking upon themselves as a meaningful experience for their users and customers thru communication, offering and behavior. This is the backdrop of the book. DO YOU WANT TO LEARN THE ART OF CREATING MEANINGFUL EXPERIENCES? Hunting for emotion is a perfect mix of theory, tools and inspiration and a compelling X-ray examination of one of the fastest growing currencies of our times: the emotion. As reader you will be served a number of aha-experiences, easily applicable methods and cases which in no time will enable you to find your own unique and experiential way of meeting your customers, users and employees. The book exists so that you can increase the value of your company and we all together can improve the experience of the world we live in. In short; an inspiring book about experience design. 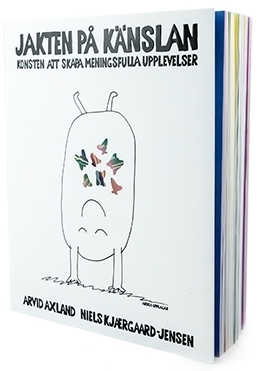 You can buy the Swedish version of the book here. Unfortunately, A TRANSLATION OF THE BOOK INTO ENGLISH IS CURRENTLY NOT SCHEDULED. Arvid Axland, Pool and Niels Kjærgaard-Jensen, InGoodCompany met for the first time at an Experience Design Course at Kaospilot in Denmark. Since then they have collaborated around a number of conferences, seminars and workshops. Together they have also developed a new process for innovation and experience design. And last but not least written this book together. Arvid´s background in marketing communication combined with Niels´ experience from organisational development and holistic experience design became the interesting mix that propelled the book forward. Arvid is one of the founders of the advertising agency Pool, based in Stockholm. His expertise is strategic brand building by which he is helping companies to increase their market value through experiential marketing communication. Arvid is a much recognized speaker, trend reader and visionary. Also he is a paradoxical combination of calm and very industrious - this rare treat best exposed by his ability to constantly bring forward new perspectives and possibilities while at the same time refraining from action until he has felt his way.